"Martin judged his audience perfectly in terms of content and pace and immediately had everyone in stitches. He was the highlight of our evening and I would recommend him unreservedly." "Everybody I spoke to commented on what an enjoyable evening they had had without a "Blue" word being spoken. I would definitely have no hesitation in recommending him." "I am writing to you in appreciation of Martin Gold's efforts and, in particular, congratulate him on a good clean performance. His act was well balanced without any vulgarity, swearing or smutty comments - well done and many thanks." 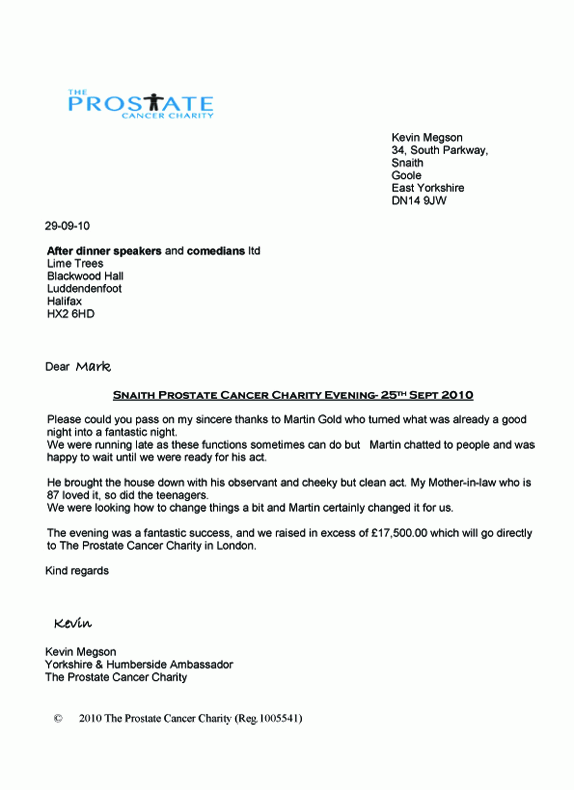 "It would be appreciated if you could pass on our thanks to Martin who performed at Rawdon �Golf Club on Saturday night. Everybody who attended had a fantastic time and all agreed that he was one of the best performers we have had. 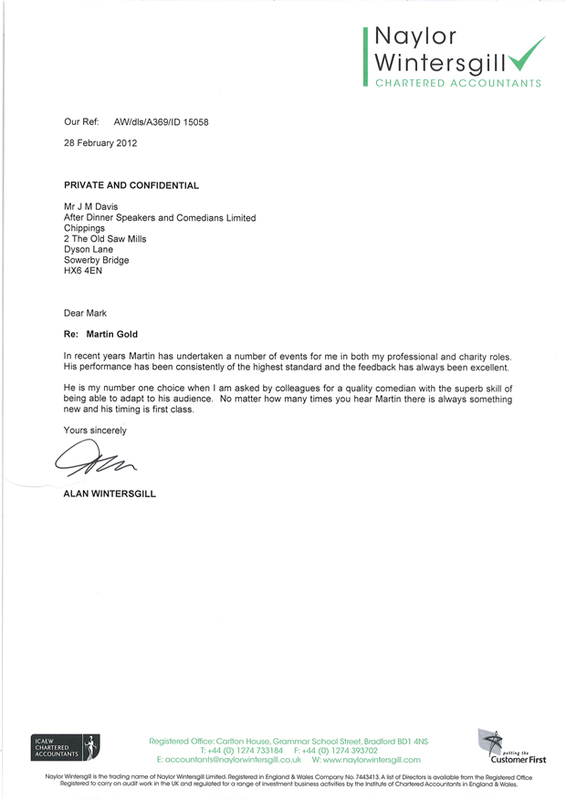 I will certainly recommend him to other golf clubs." " Star In The Making, one of the best things to happen to Jersey." "A�master of his trade, Innovative, up to date, yet delivered in a way that can only be described as perfection"
" Top class comedy entertainment - dispatched a battery of jokes gratefully acknowledged by the audience which he had eating out of his hand almost as soon as he came on stage.."
"Coming highly recommended, Martin Gold is a comedian of the highest calibre. He commands his audience whatever age and on every level within seconds of walking on stage. His razor sharp wit, not to mention his immaculate appearance leaves his audience aching for more. After booking Martin on a number of occasions, I can say without fear of contradiction that he is nothing short of (The Consummate performer)." Political correctness is one luxury that comedians cannot afford because if such a subject was to be adhered to there would not be any comics about. Bearing this in mind members of the audience could not have cared less about such niceties when Martin appeared. Professional in every respect, it was obvious from the start that Martin had not merely learnt his script and spilled forth in parrot fashion - he is 'a natural' and believe you me nothing is spared from his good-natured 'verbal abuse'. Frankly, I could not fault this artiste at all, his content, delivery and stage personality were quite brilliant and I was sorry when his show came to a close. "This was the best act I have seen at this particular function and in all honesty, the best comedian I have seen anywhere in many a year. Thanks Martin, from us all."